home page and events calendar. Check your e-mail for verification code. Check your e-mail for your code. Close and enjoy full access! 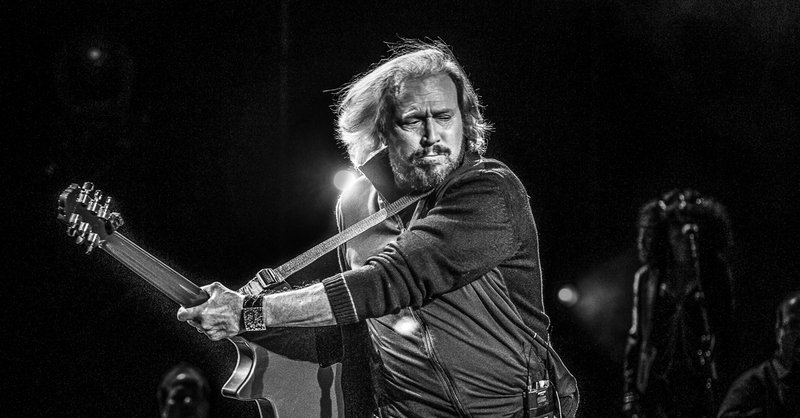 Barry Gibb took the stage on May 23rd, 2014 at Jones Beach on Long Island, NY to a overwhelming cheer from a diverse crowd. The "Mythology Tour" is his first tour since the 2012 death of brother Robin. So getting an opportunity to photograph and review the sole surviving Bee Gee was a no brainer for me. A staple in music history, the Gibb brothers are played across the globe on stations whether it be radio, satellite or internet. The 70 brought us great music from The Rolling Stones, The Beatles (mostly 60's) and The Who to just name a few however the BeeGees cornered the market on the disco front. Saturday Night Fever spent 24 weeks atop the Billboard charts and influenced a culture of leisure suits and dancing. Peeling back the obvious layer was the genius of Gibb and company who created such catchy hooks and melodic multi-octive harmonies that is only matched by acts such as Queen. A song like "Lonely Days" has so little lyrical content however is a fan favorite for it's slow build and powerful payoff from men whose voices are higher than your sisters. Fast forward to today, Gibb's staccato falsetto may trail off mid syllable but with the help of his three beautiful backup singers which normally included brother Maurice's daughter, Sami. She was ill tonight but Gibb made it clear she was missed and wished her a speedy recovery. Now if I did not know it, I would have never thought Steve (on guitar & accompanied vocals) was Barry's son. His tattoo's and beard can put him on the set of "Sons Of Anarchy" sooner than the stage with dad. His voice deep and gravely instead of smooth and high. Mom's genetics must have won here but on the guitar, Steve tore it up. Starting the set off with "Jive Talking" brought the fans who were braving this chilly, rainy night to their feet, singing along and dancing in the isles. No, a little rain would not stop these people who came from the Island, five boroughs and Jersey (myself included) from seeing a legend tonight. His over 2 hour trip through a vast catalog that included duets that had backup singer, Beth Cohen, stepping in for both Barbra Streisand (on "Guilty" with "Woman in Love") and Dolly Parton (on "Islands in the Stream"). In one instance, Robin Gibb himself popped up on a video screen and traded virtual vocals on "I Started a Joke,". I do have to say the part where Barry appears to be flying in the clouds up on the screen with his arms in the air, seemed well...strange but to each their own. Gibb also paid homage to Jersey artist and legend himself Bruce Springsteen. He talked about how Bruce performed a BeeGee song in Australia and he wanted to return the favor and proceeded with his rendition of "I'm On Fire". He did a great job. The eight-piece band - three electric guitars, two keyboards kept the groove in place. Video screens treated the audience with home movies of the Gibb family. It's no secret that they were not always as harmonious in life as they were on stage but Gibb dealt with that with a simple "We didn't always get along as most families do" which for me, was a bit minimal to counter the past history but you also have to be mindful of the regret Gibb must have now that his brothers have passed, God rest their souls. In tribute to the great Mr. King's passing, we are running his cover this month as a sort of flag of rememberance of this great man and pioneer. 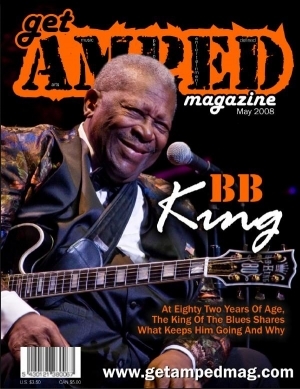 To say that BB King is a piece of the foundation in blues is understating the influence and joy brought to so many. Still on the road entertaining the masses at the age of 86 is nothing short of amazing. Type #GetAMPED on your Instagram photos when you're out at a show and they will show up here! Our PhotoTour is just a sample of the show images we capture. Click on the image to see more! copyright GetAMPED Studios, LLC. All rights reserved.